This application is a Divisional Application of U.S. application Ser. No. 11/183,546, filed on Jul. 18, 2005, which is a Divisional Application of U.S. application Ser. No. 09/849,843, filed on May 4, 2001, which claims priority under 35 USC 119(e) to U.S. Provisional Application Ser. No. 60/209,250 filed on Jun. 5, 2000. The lipophilic fluid herein is one having a liquid phase present under operating conditions of the appliance. In general such a fluid can be fully liquid at ambient temperature and pressure, can be an easily melted solid, e.g., one which becomes liquid at temperatures in the range from about 0 deg. C. to about 60 deg. C., or can comprise a mixture of liquid and vapor phases at ambient temperatures and pressures, e.g., at 25 deg. C. and 1 atm. pressure. Thus, the essential lipohilic fluid is not a compressible gas such as carbon dioxide. It is preferred that the lipophilic fluid herein be inflammable or, have relatively high flash points and/or low VOC characteristics, these terms having their conventional meanings as used in the dry cleaning industry, to equal or, preferably, exceed the characteristics of known conventional dry cleaning fluids. Moreover, suitable cleaning fluids herein are readily flowable and nonviscous. In general, cleaning fluid herein are required to be fluids capable of at least partially dissolving sebum or body soil as defined in the test hereinafter. Mixtures of lipophilic fluid are also suitable, and provided that the requirements of the test are met, the lipophilic fluid can include any fraction of dry-cleaning solvents, especially newer types including fluorinated solvents, or perfluorinated amines. 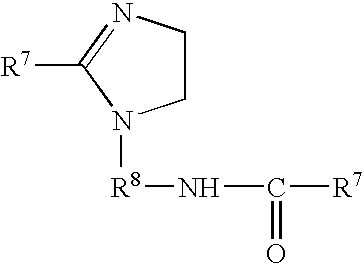 Some perfluorinated amines such as perfluorotributylamines while unsuitable for use as lipohilic fluid may be present as one of many possible adjuncts present in the lipohilic cleaning fluid; Other suitable lipohilic fluids include diol solvent systems e.g., higher diols such as C6- or C8- or higher diols; organosilicon solvents including both cyclic and acyclic types, and the like; and mixtures thereof. A preferred group of nonaqueous liquids suitable for incorporation as the major component of the cleaning fluid includes low-volatility nonfluorinated organics, silicones, especially those other than aminofunctional silicones, and mixtures thereof. Low volatility nonfluorinated organics include for example OLEAN and other polyol esters, or certain relatively nonvolatile biodegradable mid-chain branched petroleum fractions. Suitable silicones for use as a major component, e.g., more than 50%, of the cleaning fluid include cyclopentasiloxane, sometimes termed “D5”, or linear analogs having approximately similar volatility, optionally complemented by other compatible silicones. Suitable silicones are well known in the literature, see, for example, Kirk Othmer's Encyclopedia of Chemical Technology, and are available from a number of commercial sources, including General Electric, Toshiba Silicone, Bayer, and Dow Coming. Other suitable fluids are commercially available from Procter & Gamble or from Dow Chemical and other suppliers. For example one suitable silicone is SF-1528 available from GE silicone fluids. It is worth noting that SF-1528 fluid is 90% cyclopentasiloxane (D5). In addition to the above lipophilic solvents, carbon dioxide-philic surfactants can be included in the lipophilic fluid of the present invention. 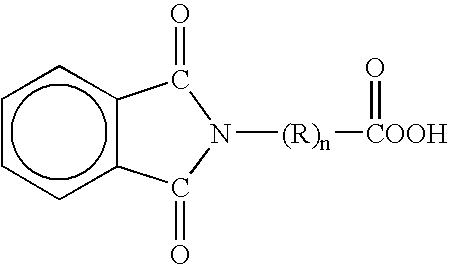 Nonlimiting examples of such carobn dioxide-philic surfactants are described in U.S. Pat. Nos. 5,977,045, 5,683,977, 5,683,473 and 5,676,705. ALFONIC, BRIJ, GENAPOL, NEODOL, SURFONIC, TRYCOL. See also U.S. Pat. No. 6,013,683 Hill et al.,. 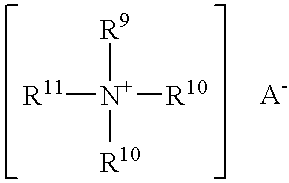 Where each R′R″ is independently selected from the group consisting of 12-30 C atoms or derived from tallow, coconut oil or soy, X=Cl or Br, Examples include: didodecyldimethylammonium bromide (DDAB), dihexadecyldimethyl ammonium chloride, dihexadecyldimethyl ammonium bromide, dioctadecyldimethyl ammonium chloride, dieicosyldimethyl ammonium chloride, didocosyldimethyl ammonium chloride, dicoconutdimethyl ammonium chloride, ditallowdimethyl ammonium bromide (DTAB). Commercially available examples include, but are not limited to: ADOGEN, ARQUAD, TOMAH, VARIQUAT. See also U.S. Pat. No. 6,013,683 Hill et al.,. The “glycerol esters” also include the polyglycerol, e.g., diglycerol through octaglycerol esters. The polyglycerol polyols are formed by condensing glycerin or epichlorohydrin together to link the glycerol moieties via ether linkages. The mono- and/or diesters of the polyglycerol polyols are preferred, the fatty acyl groups typically being those described hereinbefore for the sorbitan and glycerol esters. More detailed disclosure and of exemplification of these optional nonionic fabric softeners can be found in U.S. patent application No. 09/242,623 to Robert et. al., filed Aug. 19, 1996, P&G docket No. 6214; and Ser. No. 09/319,751 to Michael et. al., filed Dec. 19, 1996, P&G docket No. 6442 both incorporated herein by reference. Other examples of Component (b) are behenyltrimethylammonium chloride wherein R9 is a C22 hydrocarbon group and sold under the trade name Kemamine® Q2803-C by Huniko Chemical Division of Witco Chemical Corporation; soyadimethylethylammonium ethylsulfate wherein R9 is a C16-C18 hydrocarbon group, R10 is a methyl group, R11 is an ethyl group, and A− is an ethylsulfate anion, sold under the trade name Jordaquat® 1033 by Jordan Chemical Company; and methyl-bis(2-hydroxyethyl)-octadecylammonium chloride wherein R9 is a C18 hydrocarbon group, R10 is a 2-hydroxyethyl group and R11 is a methyl group and available under the trade name Ethoquad® 18/12 from Armak Company. 7. The composition according to claim 6 wherein the diol comprises C6, C8 or higher diols. 10. 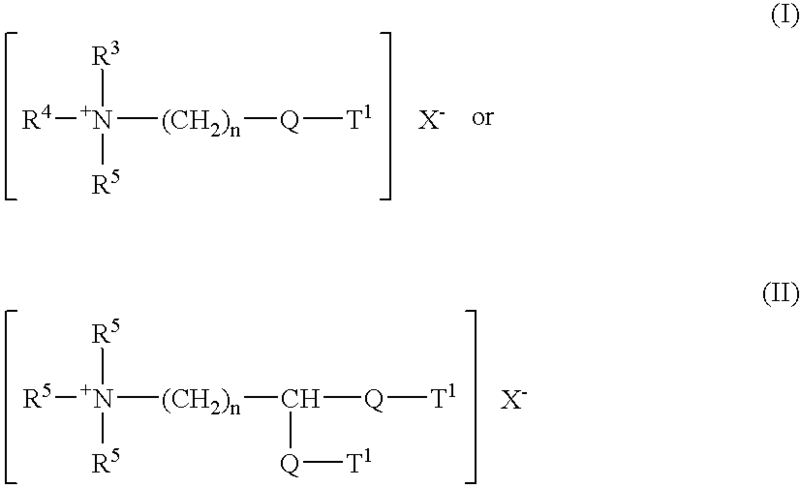 The composition according to claim 1 wherein the non-silicone surfactant is a nonionic surfactant selected from the group consisting of a polyethylene oxide condensate of nonyl phenol and myristyl alcohol, or a fatty alcohol ethoxylate having the formula: R—(OCH2CH2)a, wherein a is 1 to 100 and R C8-C20 alkyl. 11. 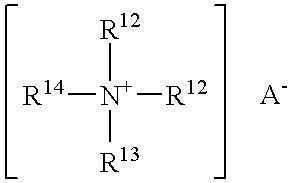 The composition according to claim 1 wherein the non-silicone surfactant is a cationic surfactant which is a dialkylmethylammonium salt having the formula: R′R″N+(CH3)2X−, wherein each R′ and R′ is independently selected from the group consisting of 12-30 Carbon atoms or derived from tallow, coconut oil or soy, and X is Cl or Br. 14. The composition according to claim 1-wherein the finishing agent is selected from the group consisting of water, finishing polymers, odor control agents, odor neutralizers, perfumes, properfumes, anti-static agents, antimicrobial agents, soil release agents, fabric softening agents or actives, insect and/or moth repelling agents, light protecting agents, sizing agents, crisping agents, hand-modifying agents, and mixtures thereof.